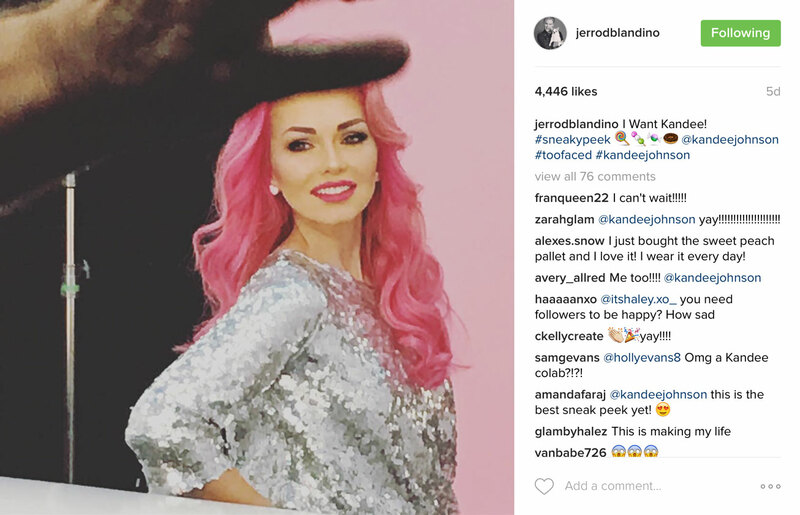 Beauty News & Gossip 11/01/17: Jeffree Star, Huda Beauty, Too Faced & More! It’s been quite a while since I published my last Beauty News & Gossip post, but you guys have told me that you like them, so I thought I’d start up the series again. 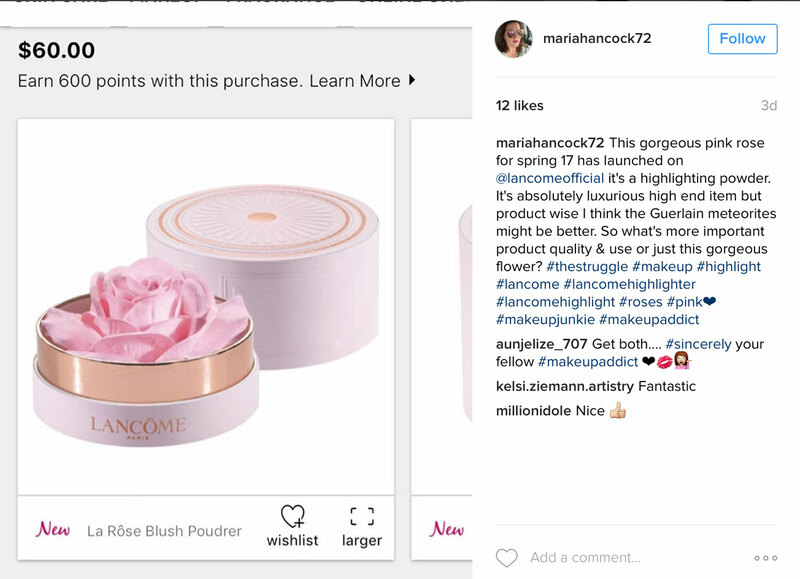 I’m aiming to post on a weekly basis covering all the latest hot beauty news, influencer gossip and exciting new releases – enjoy! Ok so I woke up this morning and the first thing I saw on my social feeds is that Jeffree Star has destroyed a $5.5k Chanel bag on his Youtube channel. Him and his BFF Manny MUA got together to cut up some makeup products with hot knives (as you do) just for LOLs, and Jeffree decided to take it one step further and mutilate a Chanel Boy bag from his collection. By the looks of things this has been one of his most viewed videos in such a short space of time since publishing, and comments have been falling in one of two very distinct camps – Jeffree fans are saying (very rightly so) that ‘it’s his money he can do what he likes with it’ but people are also saying (again very rightly so) comments along the lines of ‘people are starving in this world, and he chooses to do this..’. I totally agree that he can do what he likes with his own things, but he might as well be burning a $5k wad of cash for the sake of gaining views, which in my opinion is in very poor taste – but then would we expect anything else from Jeffree Star?? I’d be interested to hear your thoughts on this. 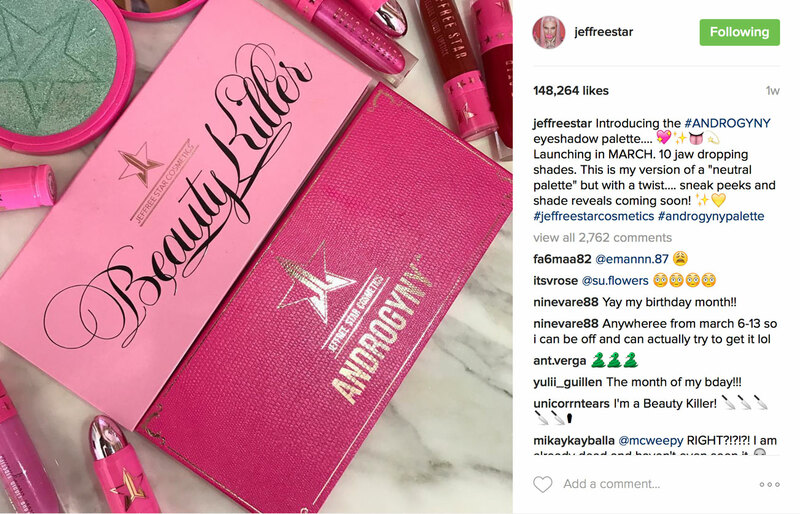 In other Jeffree Star news, he’s also recently announced that his much anticipated Androgyny Palette will be launching in March. The teasers above shows his second palette has a deep pink textured casing with gold lettering, and the eyeshadows look like they’re going to be a big hit with fans – there appears to be a range of intensely coloured warm matte shades included (judging by the colours Jeffree is wearing above) and I think it will be a total sell out. 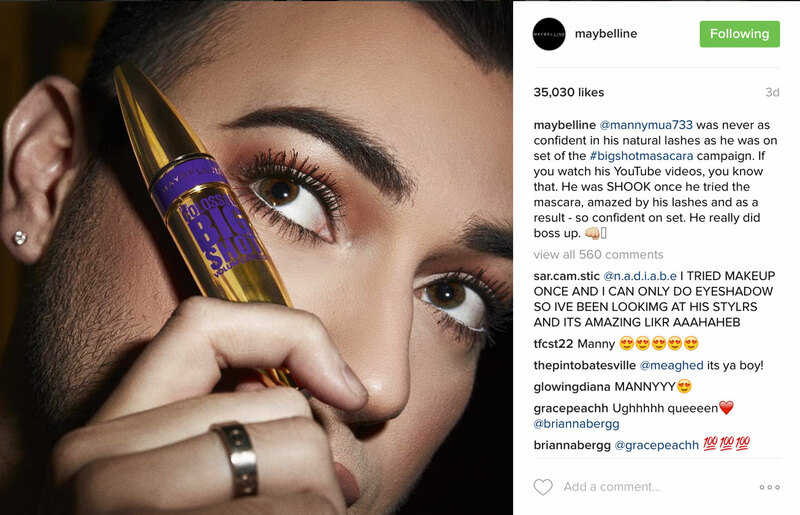 You may have also noticed recently that Manny MUA is collaborating with Maybelline on their Big Shot Mascara campaign. I noticed this on Twitter when the ad first launched and didn’t really give it too much thought. Then it popped up again on Facebook via a BBC news article, I noticed there were thousands and thousands of comments, so thought I’d take a moment to look through. Oh my gosh, the public has had such a strong reaction to this, I really was quite shocked. It was very divided, with a disturbing amount of people being absolutely horrified that a man is wearing makeup (I mean, really? ), but luckily there were plenty of positive comments too which appeared to outnumber the negative. It really does worry me how people can be so close minded – we’re in 2017 for Christ’s sake! 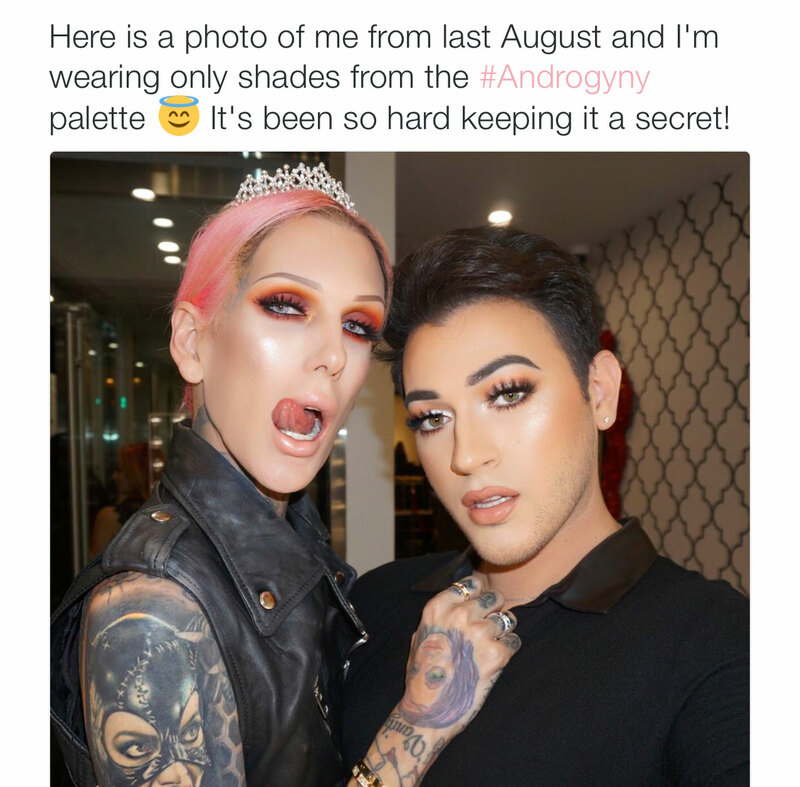 I think it’s a great collab, and Manny is the perfect influencer to team up with Maybelline – maybe this just seems obvious to me though because I’m part of the beauty community? I don’t know, I think attitudes are changing, but we still have definitely a long way to go. I also think it’s a very clever marketing move on Maybelline’s part – what better way to get your beauty brand talked about across every media channel than to do something ‘controversial’ like having a male in full makeup as the star of the campaign – what do you think? What would a news and gossip post be without Jaclyn Hill!? It looks like Jaclyn is coming out with another new collaboration within the next two months. 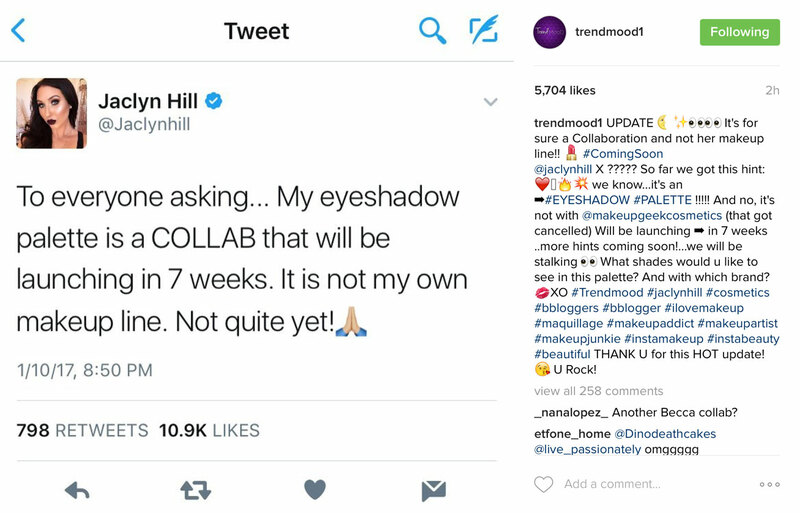 She’s not giving away much at the moment but we know it’s an eyeshadow palette, and it’s in collaboration with a brand – maybe Becca again? Or maybe someone new? 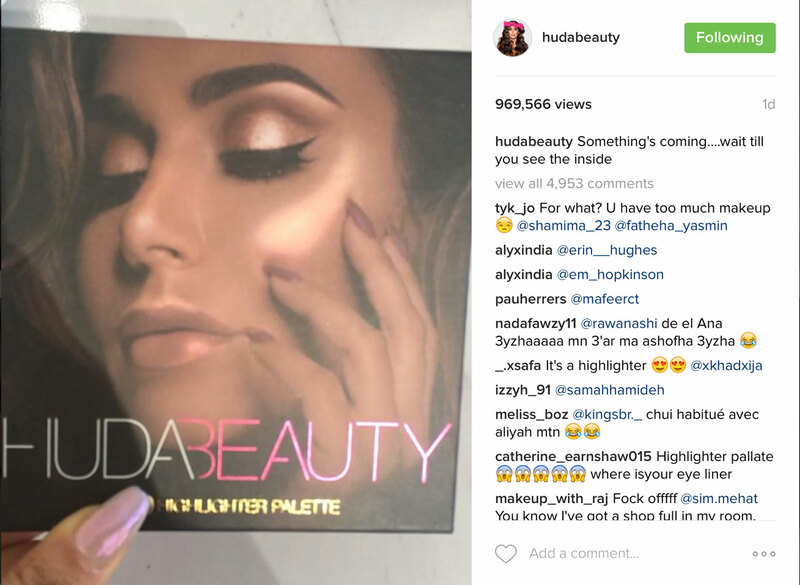 I never managed to get my hands on the Huda Beauty Rose Gold Eyeshadow palette – though it looks stunning I just couldn’t justify the expense. She’s now teasing fans with the outer packaging of her upcoming Highlighter Palette – I can’t wait to see what’s inside, I bet it’s going to be stunning! 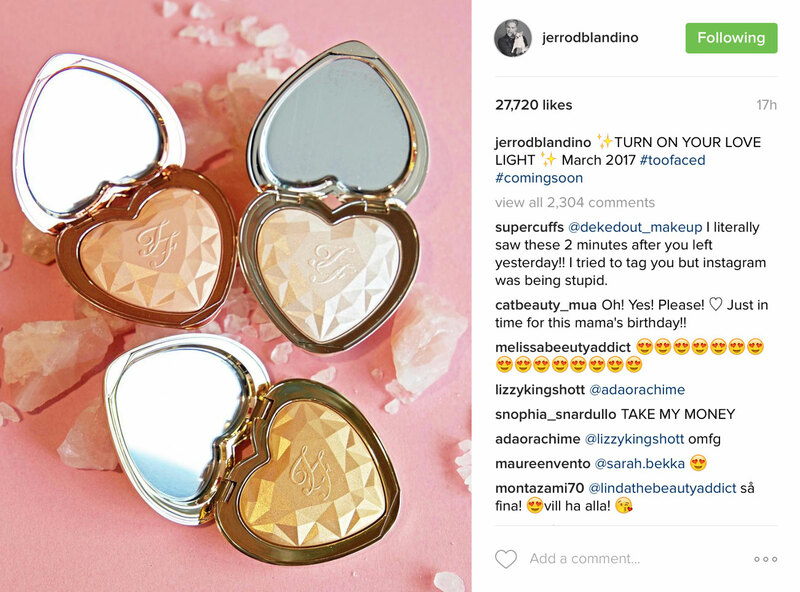 On to new products now, and you may have noticed that Too Faced is busting out new products like there’s no tomorrow right now, and I’ve just caught wind of yet another gorgeous looking launch – their beautiful Lovelight Highlighters will be coming in March this year – don’t they look gorgeous! 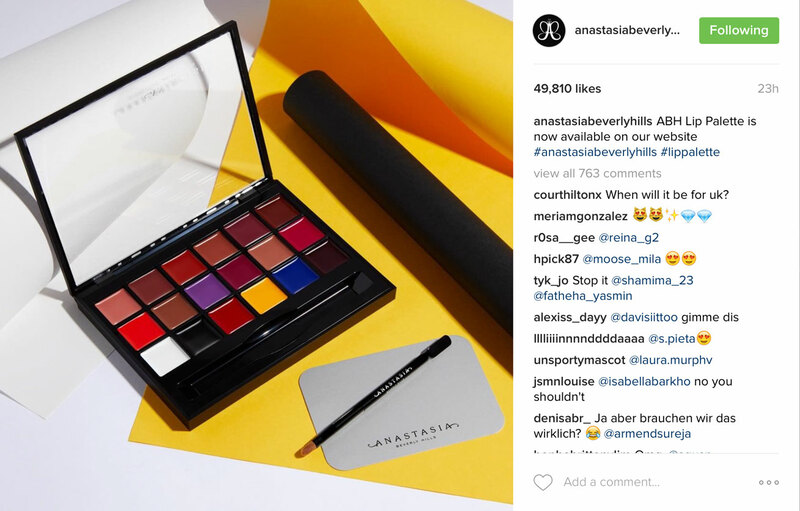 Anastasia has also just launched their first Lip Palette, which is perfect for those that like to experiment with lip shades and change their look frequently. This palette contains a large selection of lipsticks as well as primary colours and black and white shades, so you can pretty much come up with any colour imaginable! This is available now on the Anastasia US site but not yet on the Anastasia UK site. After visiting New York last year on a press trip, and spending rather a lot of time in Sephora, I discovered Milk Makeup. I have their Cooling Water and Holographic Stick, both of which I love. 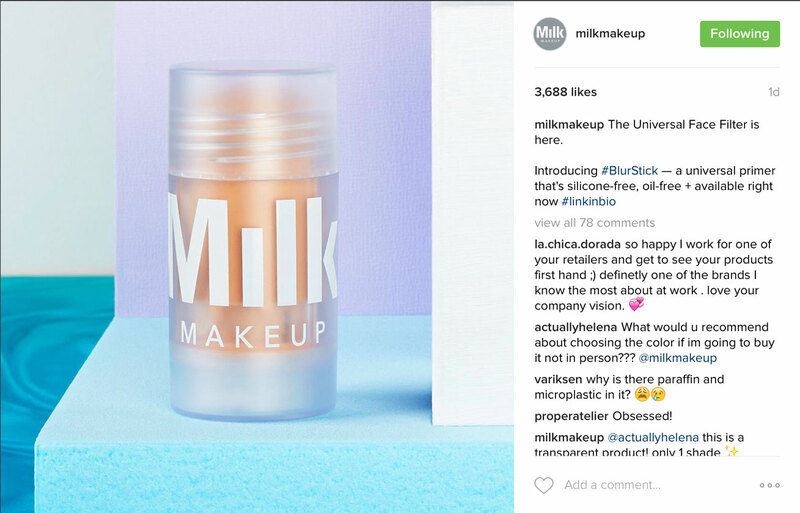 And I recently heard about their brand new Blur Stick – it’s just now launched at Sephora, and it promised to blur skin’s imperfections to give you a ‘real life filter effect’. I really love the sound of this. 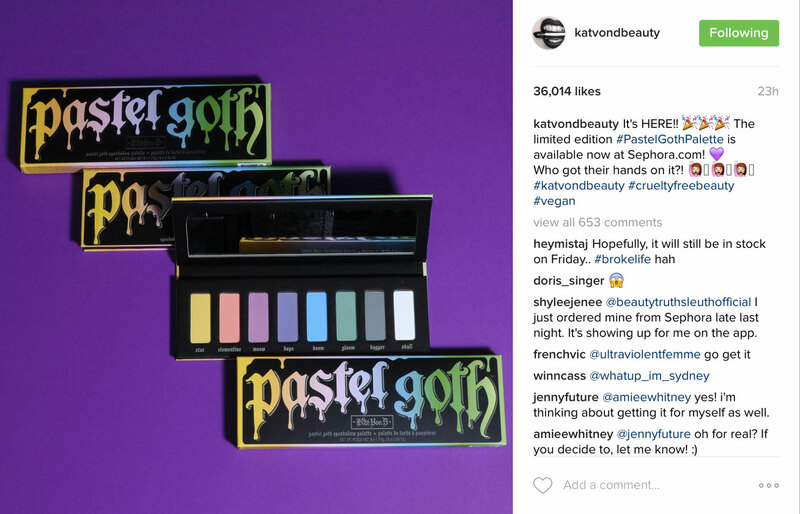 The brand that only a few months ago brought us the original Unicorn Makeup brushes (I have them but can’t bring myself to use them!) 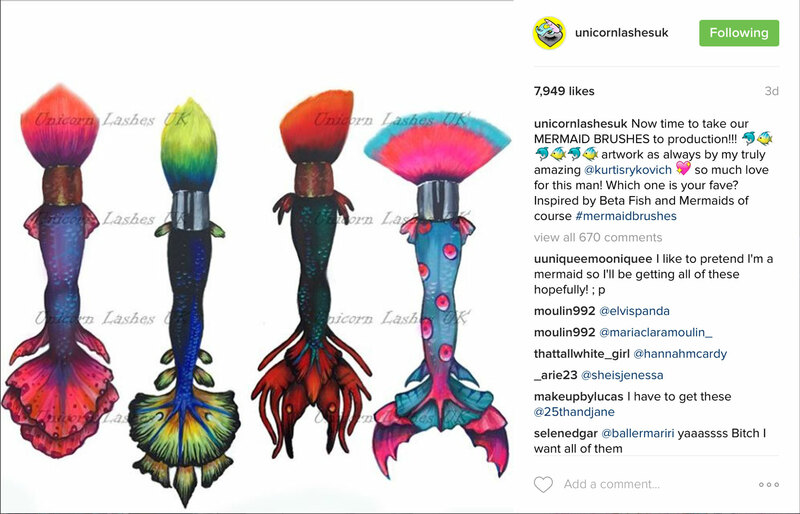 has recently announced an upcoming collection of Mermaid makeup brushes! Above you can see the original artist sketches for the brushes, it also says they’re now going into production, so watch this space for news of the launch date. And oh my gosh, the Lancome Rose Collection is EVERYTHING. The highlighter is shaped like an actual rose and it’s just so beautiful! There’s also a limited edition brush to go with it, as well as a palette and a few other products in the collection. These are all available now on the Lancome US site. I can’t wait till it’s available in the UK!